Life after the end of the epidemic of coronary heart disease. 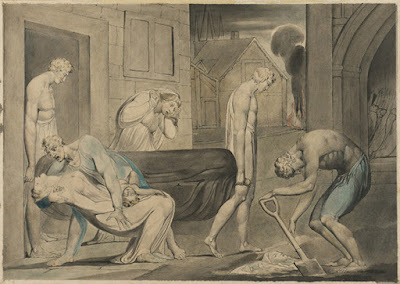 Pestilence - William Blake, 1805. Museum of Fine Arts, Boston. I have described in previous Posts that during the second half of the 20th century we experienced a very serious epidemic, that of coronary heart disease (CHD). It occurred in the UK, in the USA, and in all "western" countries. It became the major cause of death, responsible for the deaths of 25% of the population. It was clearly very serious, but not at the time acknowledged as an epidemic. People, especially men, died prematurely in large numbers before the age of 70 years. The epidemic has now effectively come to an end. The populations of what we call the western world are now free of major diseases. Not only has the epidemic of CHD come to an end, but the risk of an individual developing a stroke has diminished profoundly, and cancer risk has also declined (the larger population means that there are more people with cancer). There have been no major wars during the past half-century, and consequently there has been a remarkably low number of deaths from warfare. There is no famine: we are all well-fed, arguably too well-fed. We are healthier and many more of us live longer than at any time in history. 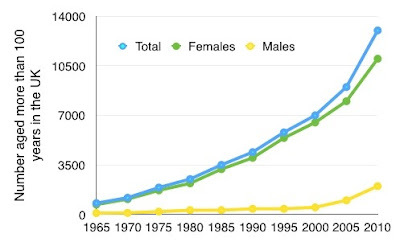 The large number of premature deaths from CHD at the height of the epidemic can be seen in Figure 1, data from 1968. 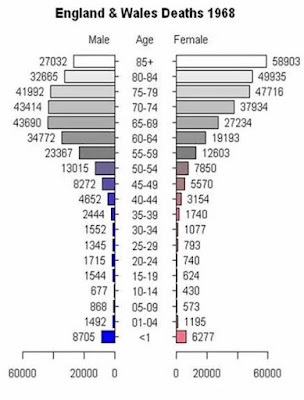 Men in particular show a bulge of deaths in middle age, and very few lived beyond the age of 85. The death profile for women was much better, with a wider spread of deaths throughout the latter decades of life. These life expectancy tables were taken for granted at the time. They were natural, and a great improvement on the first half of the 20th century, when there were many deaths from what were diseases obviously caused by micro-organisms. The fact that life expectancy for men was shorter than that for women was presumed to be the effect of smoking and alcohol, industrial and wartime injuries, and generally a more careless male approach to life. In 1968–1970 the major cause of death in the population was myocardial infarction (MI), the most important and at that time the usually fatal clinical manifestation of CHD. This was again part of nature, the assumption being that it had always been present, an assumption that we now know was seriously wrong. I have indicated in previous posts that the rapid decline in deaths from CHD was sudden and completely unforeseen. It was also unexplained, but of course many people assume that it was the result of medical interventions. This was not the case as most of the decline occurred twenty years before effective treatments became available. Between 1970 and 1990 the CHD death rate in England & Wales dropped from its peak of 550 to about 100 per 100,000 per year (an 85% reduction). This was not appreciated or acknowledged at the time and it would appear that has not incorporated into health service planning.The assumption would have been that an annual; mortality rate from CHD would have continued at 550 per 100,000. Figure 2 shows the decline. 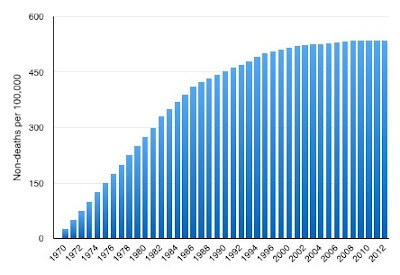 What it meant was that in 1980 300 per 100,000 people in the UK did not die from CHD, that is who would have done had the 1970 mortality rate been sustained. By 1990 this was 450 per 100,000. These people would thereafter live into an older age and experience the infirmity that is inevitably part of it. 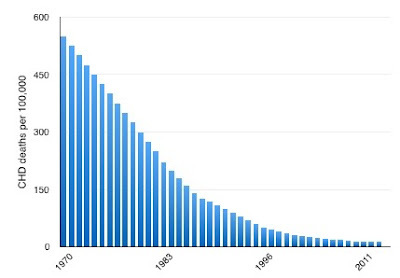 During the years 1970 to 2010 a very large number of people each year did not die, as shown in Figure 3. The number of people not dying because of the end of the epidemic of CHD was cumulative year on year. In total it was about 16,000 per 100,000 of the population. With the UK population of 60 million, this represents just under ten million, during the 40 years 1970 to 2010. Normally with steady state population the number deaths per year equals total population divided by the average age at death. 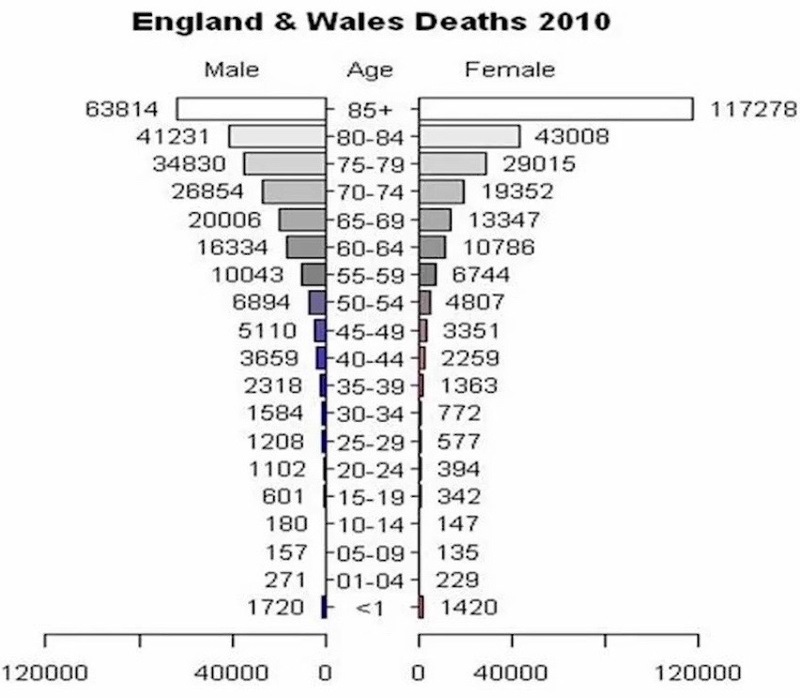 With the UK population of 60 million and with average age at death of 75, we would expect a total of 800,000 deaths per year, which amounts to 32 million deaths in 40 years. This equates to the 1970 level of 25% of deaths being due to CHD. The increasing number people not dying from CHD represents a fairly rapid population growth, but of people mainly beyond working age and at an age of increasing health and social care requirements. Of course not all the ten million who have not died from CHD during the past 40 years will still be alive. The population growth will not be so much, but whereas CHD usually resulted in sudden death from MI, the ten million people will experience or will have experienced a much slower process of dying, with much greater health need. 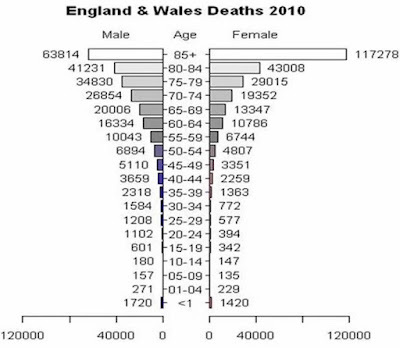 The profile of ages of deaths in the UK can be seen in Figure 4. The contrast with Figure 1 is remarkable. The late middle age bulge for male deaths has disappeared completely. For women there are many fewer deaths in late middle age and more in the very elderly. Note also many fewer deaths in the first year of life. 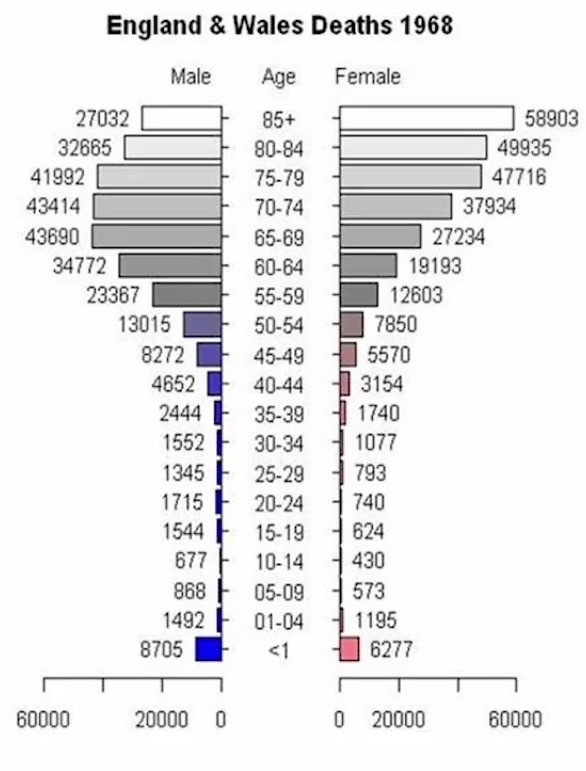 A further recent change in the age structure of the population is an increase in centenarians. The number of those living beyond the age of 100 years rose from 1080 in 1970 to 12,640 in 2010. We can see from Figure 5 that the rise is exponential. Unless another epidemic occurs to control the population of the very elderly, it is estimated that the number of centenarians will be 22,000 in 2020, 90,000 by 2034, and 250,000 by 2050. The socio-economic effects of this are already noticeable and will be increasingly so in the future. It would appear that throughout human existence famine, war, and pestilence are necessary to control the size of the population. At the present time we have none of them. 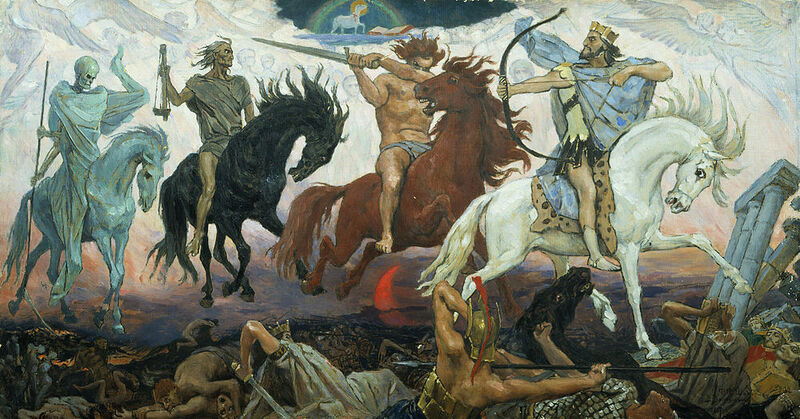 The Four Horsemen of the Apocalypse, Pestilence, War, Famine, Death.